Thanks to such moves as simulating reforms in the country and promising his Western partners to improve diplomatic relations, Vladimir Putin clearly wants to gain time as he has currently no other choice due to Russia’s poor economic situation and apparent lack of success on the international arena. Russian President finally took advantage of the inauguration of his new term in order to limit the country’s aggressiveness. Putin’s “reset” strategy consists of two potential options. According to the maximalist plan, Russian President will strive to persuade United States President Donald Trump to conduct talks with the aim of bridging the gaps between the two countries. As for the minimalist one, it envisages an attempt to reset relations with Europe. Undoubtedly, Putin will count on a thaw in U.S.-Russia relations but he would also be satisfied with better relationships with Europe. Russian President’s plans are additionally fostered by such factors as a trade policy conflict within the transatlantic community, the Nord Stream 2 pipeline project and nuclear deals with Iran. In this context, the United States can be perceived in terms of Germany’s main opponent, and the Kremlin seeks to improve its relations with Berlin. Nevertheless, Moscow is now facing a way more difficult task, which consists in convincing France to cooperate. The Kremlin aims to build within European Union a coalition of opponents of sanctions imposed on Russia. In the first weeks of the new term of office, Putin paid special attention to enhance his country’s relations with such countries as Germany, Austria and Bulgaria. The Russians also hope for further development of the political situations in Spain and Italy. Moscow will be also the main beneficiary of the U.S. exit from Iran deal. For the first time since 2003, Russia and part of the EU countries could be found on one side of the barricade against the US in the key problem of international security. 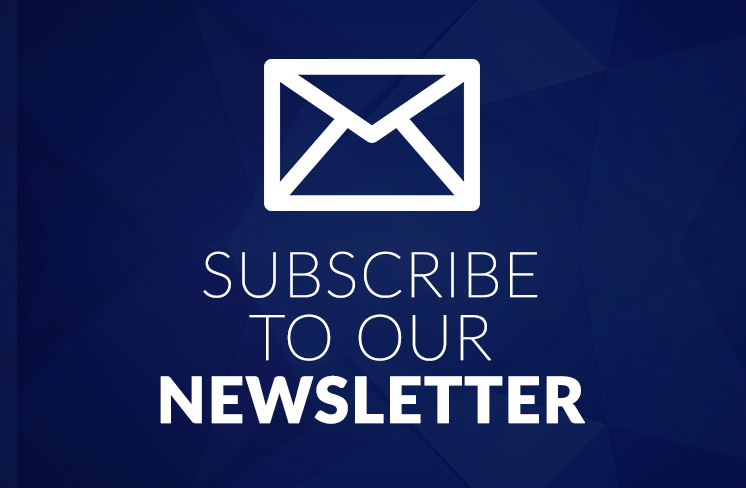 Further developments in this matter may be crucial for the results of Putin’s “thaw” strategy. Russia will neither accept any concession nor will it recognise its guilt on such issues as the annexation of Crimea, the war in Donbas, supporting murders of many civilians in Syria, interfering in democratic processes of other countries or downing of Malaysia Airlines Flight 17; in such a way, Moscow will never gain more Western “friends” as it has managed to “befriend” Germany and a small group of other countries. Putin’s policy of warming relations with the West and, at the same, abandoning his war rhetoric to the benefit of cooperation seems to be rather tactical and periodic. Without any major breakthrough in the matter of sanctions or relations with Donald Trump, Vladimir Putin will be sooner or later forced to accept the reasons of the “party of war” and thus return to the policy of aggression. Vladimir Putin changed the course of his policy at the beginning of the new presidential term. Contrary to the years 2012-2018, when he opted for aggressive rhetoric, expansive actions on the international arena and subsequent armed conflict (initiated or fuelled by Russia), Russian President has been now using best efforts to improve relations with the West that are now at their “worst since the Cold War”. Putin’s attitudes during the swearing-in ceremony (May 7) have significantly changed since his address to the Federal Assembly on March 1. The demonstration of strength and threats from March 1 symbolically closed the “war-oriented” presidential term while declaring readiness to cooperate and announcing greater concentration on internal affairs of May 7 constitutes an emblematic new opening to the West. After the first month of Putin’s fourth term of office, it has rapidly turned out that his March speech could be considered as a programmatic announcement for the next six years. More precisely, the plan managed to be partially fulfilled only in a part regarding the need for economic and social changes in Russia. Nonetheless, this fragment of the message was overshadowed by the “war” part. So why did Putin decide to introduce a “thaw” in relations with other foreign countries? He was forced by Russia’s bad economic situation (which was to some extent caused by sanctions; nevertheless, in a greater degree, by the lack of reforms in the state’s economic policy) as well as the deadlock in the country’s two largest external projects in recent years, namely Ukraine and Syria. Fortunately for the Kremlin, it was additionally fuelled by an increasingly acute conflict with the Euro-Atlantic community (induced by such factors as the Nord Stream 2 project, Iranian question and trade policy). Presidential elections held on March 18 took place in the atmosphere of hostility towards the West, in the midst of international crisis caused by the assassination attempt on Russian ex-spy Sergey Skripal. The above-mentioned presidential address came about just before poisoning former Russian military intelligence (GRU) colonel. Shortly thereafter, Putin maintained a confrontational tone at the meeting with the secret services leadership. The Kremlin noted a series of unfavorable events between the presidential elections (March 18) and the swearing-in ceremony (May 7). Several dozens countries expelled Russian intelligence officers in response to the poisoning of a former spy in Salisbury. At the beginning of April, the Trump administration imposed new sanctions on Russia that, as evidenced by the market reactions, have appeared to be the most painful for Russian economy and Putin’s inner circle so far. In Syria, the United States, Great Britain and France had formed a coalition that carried out a massive hit on the facilities of Bashar al-Assad, Vladimir Putin’s close ally, to retaliate militarily to the chemical weapons attack in eastern Ghouta. Putin’s international isolation seemed to deepen while the Kremlin understood that maintaining the sanctioning regime would not allow Russia’s economy to flourish. It was accompanied by the growing discontent of the oligarchs; it turned out that even such businessmen, who had made their fortunes in Yeltsin time, were firmly rooted in the global economy and did not belong to Putin’s milieu. In this situation, the Kremlin had to make a new opening, both in the state’s internal policy (as evidenced by the “May decree” followed by the announcement of the “economic and social” breakthrough) as well as the foreign one. Anyway, one is closely related to the other. Due to some external calculations, Russia’s Prime Minister Dmitry Medvedev (associated by Western countries with the “reset” from the past) managed to keep his post; the same factor seems to explain the government’s composition and Kudrin’s return to the great political game. In such a way, Russia seeks to demonstrate to the West than its leader aims to stay away from aggressive politics and confrontational attitudes. The evolution of the Kremlin’s attitudes is well illustrated by the calendar of meetings with foreign leaders that took place after Putin’s re-election (March 18). Even before his swearing-in for the next term of office, Russian President focused his attention on the Middle East. On March 26, he held talks with Emir of Qatar Tamim bin Hamad Al Thani in the Kremlin while on April 3-4 he paid a visit to Turkey where he met with his Iranian counterpart Hasan Rouhani. Shortly after the swearing-in ceremony, Serbian President (meeting held on May 8) and Israeli Prime Minister (talks scheduled for May 9) arrived to Moscow to commemorate the surrender of Nazi Germany. Then Putin went to Sochi for a long time where he participated in a series of meetings with numerous heads of states. On May 14, he held separate meetings with the presidents of Belarus, Kazakhstan and Moldova. Three days later, on May 17, Putin unexpectedly met with his Syrian counterpart Bashar al-Assad. After the meeting, an offensive on the “European front” took place: meetings with German Chancellor Angela Merkel (Sochi, May 18), Bulgarian President Rumen Radev (Sochi, May 22), French President Emmanuel Macron (St. Petersburg, May 24), Bulgarian Prime Minister Boyko Borisov (Moscow, May 30). On June 5, Vladimir Putin paid a visit to Austria. In the meantime, he held meetings with the Prime Ministers of India (May 21, Sochi) and Japan (May 26, St. Petersburg). The meetings were no less important than their overall message as well as blatant change of the image in the Russian media. The aim of the reunion between Putin and Merkel was to calm some controversies on the Nord Stream 2 project as well the issue of gas transit through Ukraine whereas Macron’s visit to Russia was expected to help Moscow to tackle the questions of Iran and Syria. Russian politicians have clearly limited their anti-Western statements while the Kremlin-backed television prepared its viewers that the West would soften its attitudes towards Russia, which might eventually result with lifting sanctions, as evidenced by the way of reporting the meeting with the heads of Bulgaria and Austria. Vladimir Putin’s swearing-in ceremony constituted a symbolic opening. It might come as a surprise that the event was of technical, rather than “tsarist” nature and the new-old president’s speech appeared to be more suitable for a president of an ordinary democratic country and not “imperial” Russia. The ceremony was short, with people in the street while invited guests at the Kremlin felt less tensed than six years ago. A traditional banquet at the Kremlin was also abandoned. Even though, a “sacral” element was still present, yet it was not so visible: the president took part in a prayer serviced by the Patriarch Cyril at the Kremlin. In his inaugural address, Putin avoided any instances of aggressiveness towards the West; in his opinion, there was no need to increase military expenditures as well as to tighten the belt and mobilise in the face of external dangers. The president reached out to the consent, however, only on Russian terms. 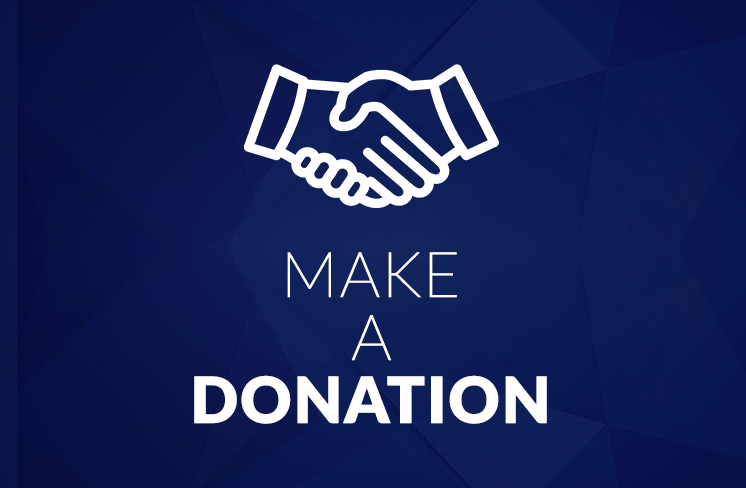 “We advocate equal and reciprocally beneficial cooperation with all countries in the interest of peace and stability on our planet. Russia is a strong, active and influential participant of international life; safety of the state and defensive capabilities are truly assured. We will still pay necessary attention to these issues,” Putin said. He also tackled the issue of domestic matters. “But now we have to use all accessible possibilities to first take care of the most important aims of domestic development, to reach an economic and technological breakthrough and to increase competitiveness in the spheres that design our future”, the president stated. The so-called May decree, signed on the same day, constituted yet another element that aimed to fit into a kind of “thaw strategy” with the West. The document resembles a long list of good wishes in terms of economic and social policy that are going to lead Russia to join the group of the world’s largest economies. The main aim of the decree is to make Russians live prosperous, longer and healthier. Nevertheless, the plan seems unrealistic and Putin will not be in charge of implementing new and all the responsibilities will have to be taken by the government. So if these goals are impossible to achieve, why has the president decided to set them out? 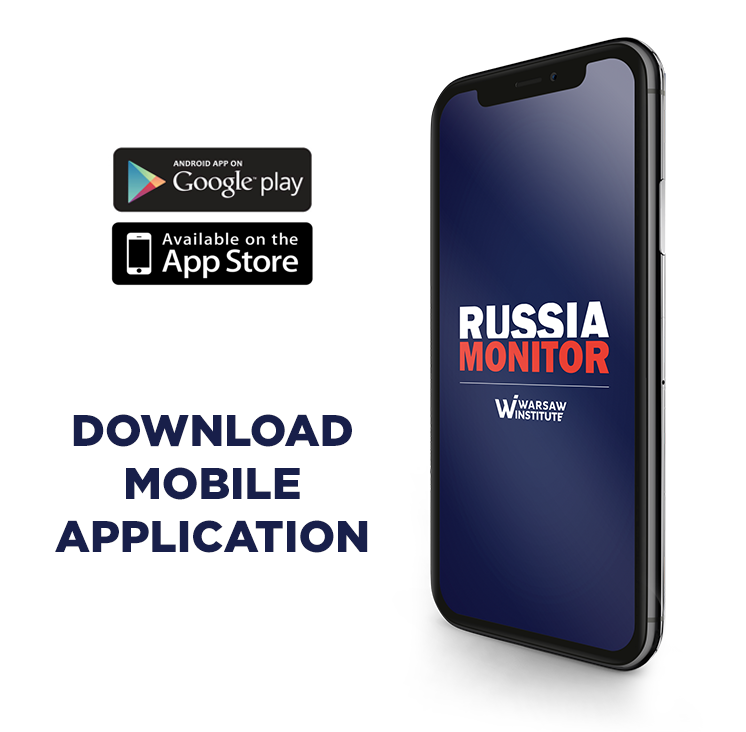 It aims to show Russian citizens that their best interests will always go first; in addition, Putin seeks to convince the West that he is ready to change his very aggressive external policy. Also the composition of Russia’s new government has become the next step of such a policy. Its head, Dmitry Medvedev, is perceived by the West as a supporter of reforms and proper relations with the country’s foreign partners. 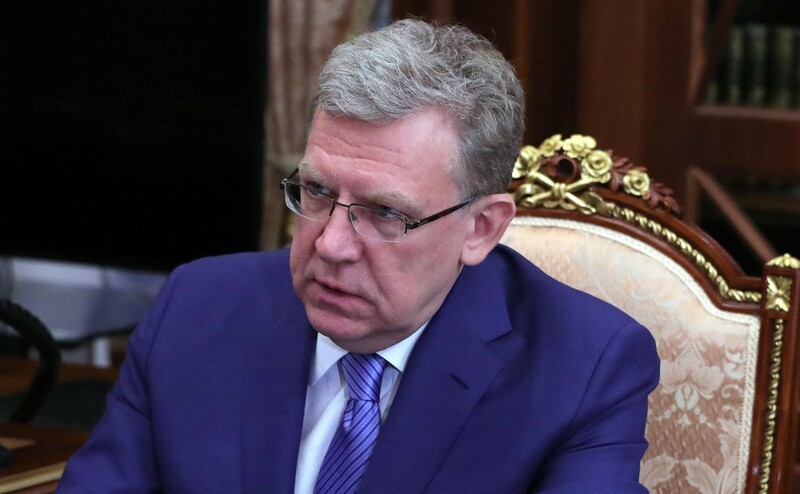 Alexei Kudrin, another Russian official whose name is expected to convince Western countries about Putin’s sincere intention, did not enter the government or the presidential administration; instead, he assumed a leadership post at the public finance watchdog Audit Chamber. Nonetheless, the Russian government use best efforts for its program to be considered as a willingness to implement Kudrin’s reformatory ideas. Kudrin is supported by “the party of peace”; moreover, for the long time he has insisted on cutting military expenses. He also emphasised that it would be difficult to set the economy in motion without the sanctions being lifted up. 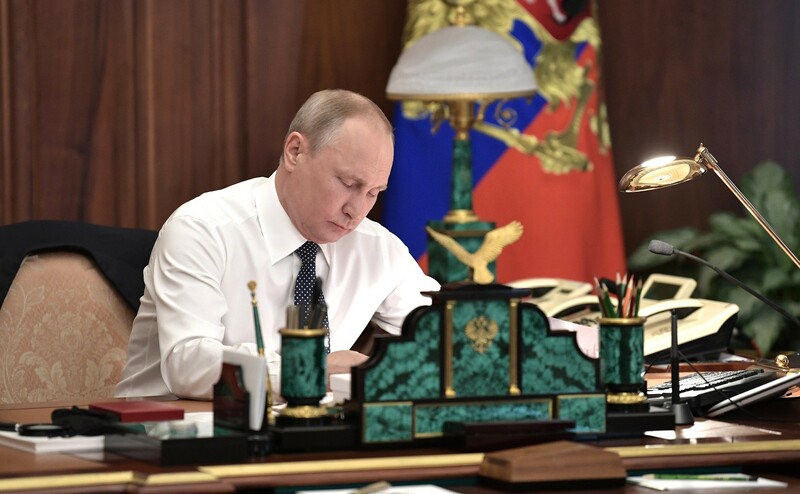 Plans for economic and social policy indicated in the May 7 decree were already announced in Putin’s annual address to both houses of the Russian parliament in early March. At that time, they were overshadowed by the military part of the message. Neither then nor now does the president point out the source of funding for announced expenditure. But this is the government’s problem as it is expected to carry out this program. On this basis, deputy prime ministers were appointed; they are supposed to act more as managers responsible for implementing the decree’s provisions. Their task will be to form country’s top twelve priority programs that will be subsequently filled with “national programs.” A similar package of documents was announced by Putin at the beginning of his previous term in May 2012. However, only a small number of these managed to be implemented. Such a situation is likely to re-occur and it should be perceived in terms of an ostentatious show addressed to foreign entities. During Vladimir Putin’s inauguration ceremony (May 7), all eyes were on two Germans in the first rows; they formally have nothing to do with the authorities in Berlin but they have been and still are very useful for Russia. 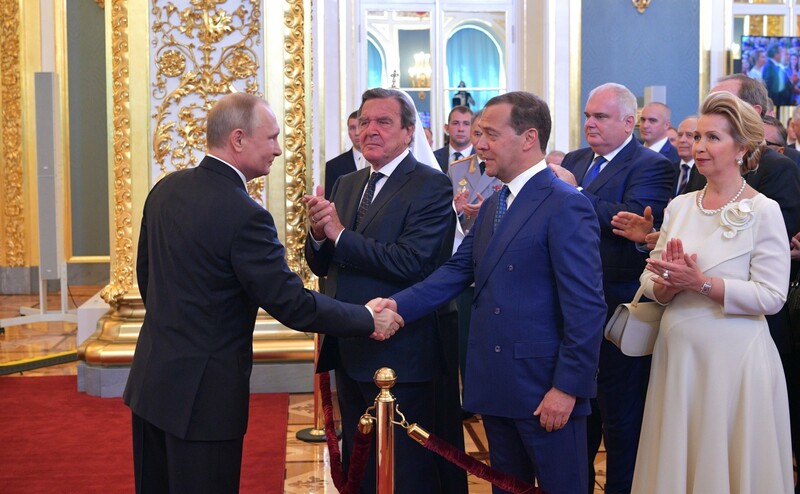 Such a remarkable moment happened when Russian President received congratulations from former German Chancellor Gerhard Schroeder (sitting in the first row) and Matthias Warning (standing right behind). For many years, both of them (but especially the latter) have played key roles in tightening Russian-German gas cooperation. The fact that they were so visible during the ceremony means that Russia appreciated their contribution to the development of Russian influence in Europe; in addition, it constituted a blatant message for Germany. Russian President has shown that he was ready to start cooperation with Europe in the terms of economy, especially in the energy sector. Just after the swearing-in ceremony, the Kremlin announced that Vladimir Putin would hold talks with Germany’s Angela Merkel only a few days later. Interestingly, it was the German chancellor who paid a visit to Russia. The last meeting took place in Hamburg in July 2017 (during the G-20 summit), but it was not bilateral. On May 18, Merkel arrived to Sochi; her visit was one of the many leaders of other countries that was held in Putin’s summer residence at that time (the day before, Russian President hosted his Syria counterpart Bashar al-Assad), which strengthened his image of a powerful leader. What is significant, Merkel was also welcomed by Russia’s Prime Minister Dmitry Medvedev. Basically, it is President Putin who receives such guests personally. 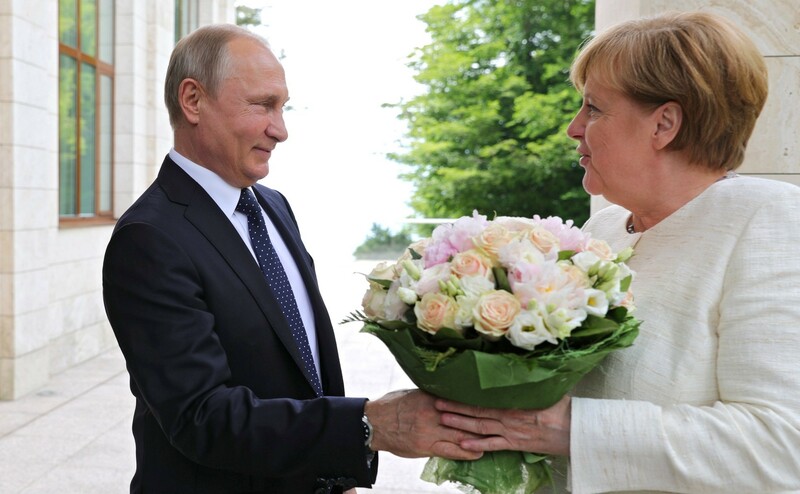 However, the presence of the former president (very positively received by Western leaders, including Merkel) aimed to emphasize an exceptionally warm character of the meeting (as evidenced by the bouquet of flowers from Putin) as well as make the West think that the Kremlin uses best efforts to improve mutual relations. As attested to by the Sochi meetings, declarations during the conferences as well as the simultaneous activity of German ministers Peter Altmaier and Heiko Maas indicate that both parties are in a hurry to implement joint projects. 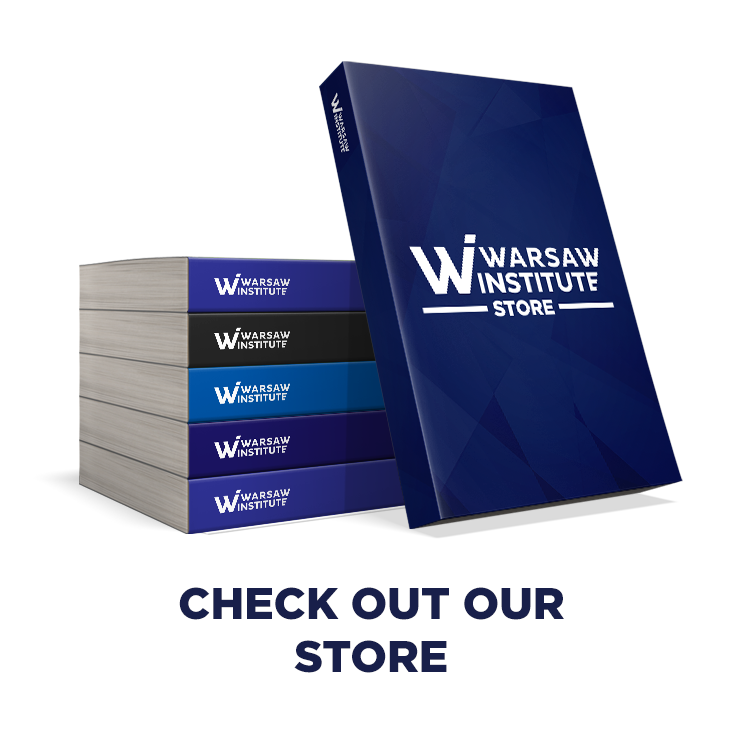 Such is the result of the strong opposition of the United States and its allies in Europe as well as the sudden deterioration of relations between Berlin and Washington; it basically means that sanctions are more likely to be imposed on European entities involved in Gazprom projects, including Nord Stream 2. Such state of affairs would be additionally fostered by Putin’s departure from his confrontational policy. In this context, it needs to be mentioned that Gazprom’s chiefs held talks with the heads of two German gas companies. Both meetings took place within the framework of the St. Petersburg International Economic Forum. Gazprom talked with Wintershall and VNG about such issues as the Nord Stream 2 project as well as joint projects to construct large gas storage facilities in Germany. In addition, the increasingly strong cooperation between the two countries, which constitutes part of the Kremlin’s new political plan, is evidenced by the idea of creating a consortium that would handle the Ukrainian gas transit system. However, according to Berlin, such a plan would solve the basic problem being an obstacle to the implementation of Nord Stream 2, namely to maintain the transit of Russian gas through Ukraine. Importantly, Germany along with some EU countries are eager to improve their relations with Moscow and to get involved in close cooperation as evidenced by the fact that the European Commission stopped its antitrust investigation against Gazprom. The ruling is very favourable for Russia, especially in the light of its previous threats. There will be no financial sanctions (as they would impede the implementation of Nord Stream 2), and some EU members, who have been offered worse conditions by Gazprom, were qualified to the inferior category due to the ruling issued by Brussels. Now Moscow seeks to achieve yet another goal that will facilitate the construction of the Nord Stream 2 pipeline. It is all about the amendment of the EU gas directive aimed against the construction of the gas pipeline. The works are soon expected to come to their end; nevertheless, both Germany and Austria have recently expressed their discontent. So everything depends on two countries whose leaders have recently met with Putin; it needs to be added that these meetings appeared to be very promising for the Kremlin. There is also a risk that Bulgaria, which currently holds the Presidency of the Council of the European Union, will delay procedures so that the final decision on the amendment to the directive could be made during the Austrian presidency. And there is no doubt that Vienna (and more specifically, Austria’s energy giant ÖMV, which has some economic interest in implementing the Nord Stream 2 project) will not be eager to adopt regulations. It might have been one of the topics discussed during Putin’s meeting with Austrian leaders on June 5. At present, Russia aims to depict the U.S. policy, which clearly opposes the Nord Stream 2 project, as manifestation of the American desire of take over the markets and to gain a monopoly position on the hydrocarbon market (which explains why the country decided to exit the Iran deal). Such declaration was made both by Schroeder and Sechin at the St Petersburg economic forum. They emphasized it was America (and not Europe) that could eventually take advantage of this situation. A similar position was also expressed by Germany’s Economy Minister Peter Altmaier. According to Moscow, Berlin and Paris are the two most important European capitals with whom the Kremlin needs to maintain good relations. So it does not come as a surprise that, along with the launch of Putin’s new “reset” strategy”, the country had to put emphasis on meetings with Angela Merkel and Emmanuel Macron. Interestingly, Moscow managed to convince Berlin (due to their common gas interest as well as recent crisis between Germany and the USA); however, it is now facing a way more difficult task to persuade Paris. 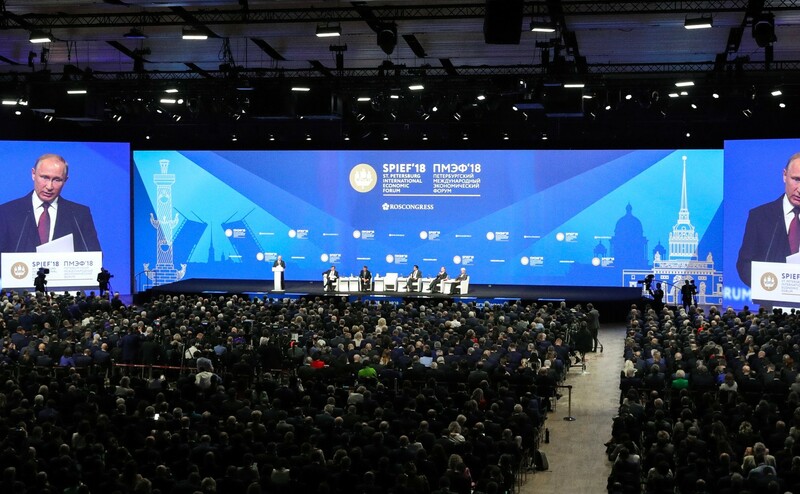 Such was the purpose of the St Petersburg International Economic Forum and Macron’s visit to the country only a week after Merkel’s meeting with Vladimir Putin. Held on May 24-26, Russia’s answer to the Davos World Economic Forum attracted many more important foreign guests than it could have been expected, especially in the light of Russia’s economy stagnation and Moscow’s recent problems with sanctions. Russia’s Economic Forum has not witnessed so many high-level foreign leaders since 2013, including French President Emmanuel Macron, Japanese Prime Minister Shinzo Abe and Chinese Vice President Wang Qishan. During the event, Russian President focused on the solidarity between Russia and Europe in order to increase the gap between the Old Continent and the United States. Initially, Macron’s visit was supposed to have an official state character. Nevertheless, France decided to change its nature over the Skripal poisoning as well as Russia’s April coalition in Syria. And Macron resisted the pressure not to pay a visit to Russia at all. At the St. Petersburg meeting, French and Russian companies signed over 50 bilateral agreements; even though, Putin probably did not gain as much as he had previously expected. The presidents of Russia and France have discussed about the situation around the nuclear deal with Iran; both leaders seemed to agree on the topic. However, they expressed different opinions in the case of the conflict in Syria. As for the Donbas issue, both presidents decided that the Minsk agreements needed to be put into force. So they confirmed that there was no solution to this problem. Vladimir Putin headed to Vienna to make his first foreign trip since being sworn in for a fourth term. First of all, Austria has always been considered as one of Russia’s friendlier EU member states. In addition, on July 1, 2018, the country takes over the Presidency of the Council of the European Union. Thirdly, the country is co-governed by a party whose members have signed an official cooperation agreement with Putin’s United Russia party. And the Austrians are seriously involved in the Nord Stream 2 project as well as they have been willing to import Russian gas for decades. 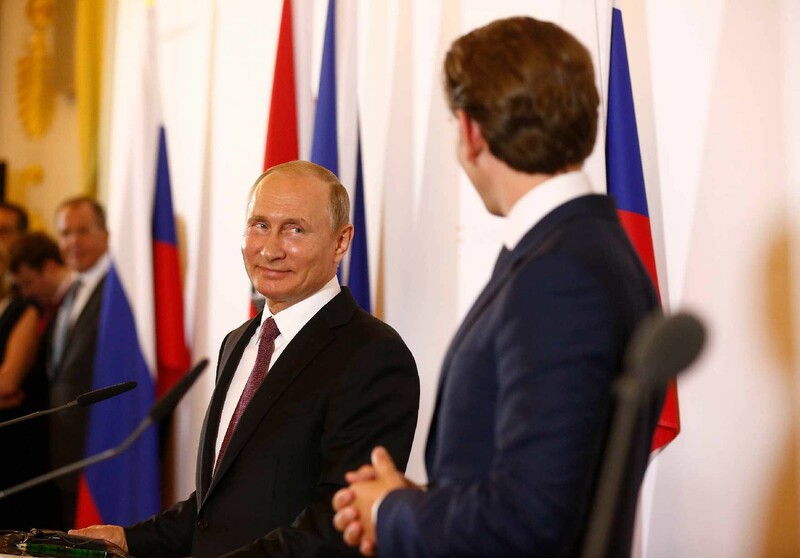 Putin’s visit to Vienna was also an occasion to announce that Russia’s gas giant Gazprom and Austria’s ÖMV energy had signed a new deal to extend Russian gas supplies to Austria until 2040. The hitherto agreement was in force until 2028. In addition, political issues were no less important. According to Putin’s strategy, Austria is to play a key role as an ally in the fight for the implementation of the Nord Stream project and lifting EU sanctions; in addition to that, Vienna is also expected to become a bridge between Russia and Brussels (and, eventually, also with Washington as evidenced by the idea of a Vienna meeting between Vladimir Putin and Donald Trump). Austria seems to perfectly fit the role as it is located in central Europe, is an EU state member country, does not belong to NATO structures, has been known for its long tradition of neutrality, and, most importantly, takes a favourable attitude towards Russia. Putin could consider comments made by Austrian Chancellor Sebastian Kurz after the talks held on June 3 as encouraging ones; Kurz declared that even if he supported the EU sanction against Moscow due to European solidarity, he also counted on the progress that would allow the restriction to be gradually relaxed. Such a state of affairs is tightly connected with the improving situation in Donbas, which can be guaranteed by Putin himself (as evidenced by the UN peacekeeping mission). Putin’s plans may be additionally fostered by recent political changes in Italy and Spain whose new governments represent pro-Russian attitudes. Such a state of matters is inducive to the implementation of the thaw policy in relations with the European Union. Italy is now ruled by the populist Moscow-friendly Five Star Movement (M5S)–Northern League government. Both parties have called for the sanctions regime to be lifted. On June 5, in his speech in the parliament, Italy’s new Prime Minister Giuseppe Conti announced that his cabinet was in favour of opening up to Russia as the country should be recognised as a “significant” economic and commercial partner and could not be perceived in terms of a military threat. Both the Five Star Movement and the Northern League have also declared that they would strongly support the idea of relaxing the sanctions. In December 2017, the leader of Italy’s Northern League party signed a cooperation agreement with Putin’s Russia United party. Nonetheless, the Kremlin’s plans to use Italy’s new government for its own purposes may be hindered by a clear political rapprochement between Giuseppe Conte and Donald Trump as well as the great reluctance of the populist Italian cabinet towards Germany. And it may be important in the context of gas policy; it needs to be taken into account that the Italian ruling coalition did not present its standpoint even in the Nord Stream 2 case. The Kremlin may be also more optimistic about Madrid’s new policy. It seems that Spain’s new government headed by socialist chief Pedro Sanchez is likely to meet Russia’s expectations. It is visible after the change of policy towards Catalonia; nevertheless, the country has recently been shocked over the appointment of new director of Spain’s Department of National Security. Its head, Pedro Banos, strongly advocates Vladimir Putin’s policy as well as he believes that Russia has the full right to build its zone of influence in the closest neighborhood. This nomination clearly indicates that Spanish left-wing government will purse a way more liberal policy towards the Kremlin. 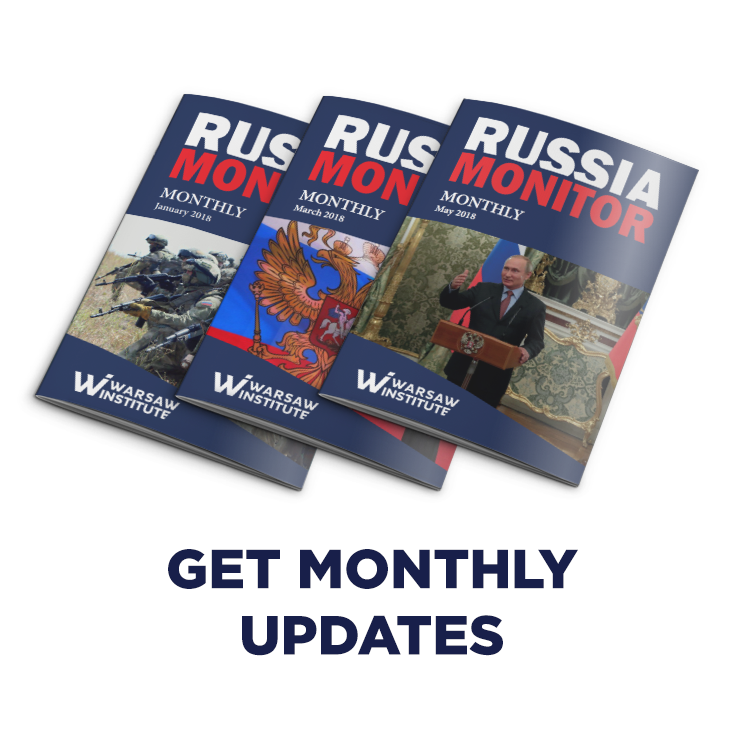 Russia has recently changed its policy towards the Western (which is especially visible in the case of Europe) in order to reduce the negative impact of sanctions that have been imposed over the last four years. But regardless of actual degree of influence of the sanctions on the Russian economy, it can be assumed that Russia will take advantage if this theme in order to give credence to the Kremlin’s new policy. During one of the sessions of the International Economic Forum in St. Petersburg, Alexei Kudrin believed that new sanctions imposed by the United States in April this year would reduce gross domestic product growth by 0.5 percent, against a previous forecast of 0.2-0.3 percent. At the same time, Russian President keeps arguing that Western sanctions do not really make sense; they are harmful to both sides as well as they hinder normal relationships between the countries. Of course, he does not mention the reason for introducing such restrictions; he said nothing about Russia’s aggressive actions towards Ukraine (EU and U.S. sanctions) and interfering in U.S. presidential election. However, lifting the sanctions is what Putin could only dream of. The decision to introduce or relax restrictions is taken collectively on the basis of the consensus of all EU member states. In fact, the standpoint of individual countries (such as Austria, Italy or Bulgaria) has no real impact on the final result. Moreover, nobody will take the risk of vetoing the sanctioning regime. So the Kremlin expects that a wider anti-sanction coalition would eventually be formed. At the same time, Putin strongly counts on reducing or even lifting the U.S. restrictions as they constitute a great burden for Russia more than any EU sanctions. Politically speaking, the Kremlin would it find more beneficial to enhance its relations with the White House. Such is the reason why Vladimir Putin remains moderate in criticising the United States; instead, he acts cautiously, fuelling the gap between America and Europe. Putin’s “reset” policy is strongly supported by Donald Trump’s decisions. There is no doubt that, after U.S. nuclear deal exit, the president made America’s European allies much closer to Russia and to the United States. Thus Putin aims to establish the same situation that has already taken place when the decision taken by the then-President George W. Bush gave birth to the France-Germany-Russia coalition. Moscow has shown its readiness to join forces with the EU in order to defend against restoring sanctions against Iran, arguing that any nuclear deal with the country could be carried out without the participation of the United States as its main guarantor. The Kremlin’s standpoint in these matters seems attractive to some European countries, especially those that do not benefit from the U.S. decisions. Since 2015, French companies have concluded bilateral agreements with Iran totalling over 26 billion dollars. So Putin takes advantage of Donald Trump’s impetuous diplomacy: little predictable, shaking various balances of forces in different world regions, and perceived by more and more capitals as potentially dangerous. So compared to such a policy, the one carried out by the Russian president can be even considered as a refuge of stability. Russia hopes that the growing tensions between the U.S. and its European partners, especially in the face of sanctions against Iran and other commercial disputes, will eventually result with breaking American-European solidarity. But the Russian leader, due to the differences between the United States a part of Europe, will aim to maintain his “strategic depth”. At the same time, Putin clearly avoids any implicit attacks on Washington, and more precisely, the Trump administration. In addition, he still makes some gestures that aim go encourage dialogue between the two countries. At the request of the Kremlin, Russia’s State Duma was forced to considerably soften the framework law on counter sanctions. Moscow hopes that the meeting between Russian and U.S. Presidents will take place and Putin will manage to convince his American counterpart to abandon the idea of tightening the sanctions policy towards Russia. Such strong anti-Russian attitudes represented by most of the establishment may result with new conflict within the American administration. So it is not surprising that Russian President asked the Austrian Chancellor to organize his meeting with the president of the United States this summer in Vienna. Kurz would eventually agree and promise to contact Donald Trump. The issue of the summit was mentioned during Putin’s visit to China. The Russian President, when asked about the possibility of his meeting with Donald Trump, said that the meeting would take place only when “the American side was ready for him”. Recently favorable international conditions (however, their development is very unpredictable due to Trump’s current political course) and the readiness of some Western countries to inaugurate a new opening in relations with Russia may not be enough to guarantee the success. The reset strategy will not work if Moscow simultaneously carries out a “negation policy”. Vladimir Putin denied Russia’s responsibility for downing the MH17 aircraft, even despite the solid conclusions drawn by the Joint Investigation Team, which were solid enough to become the basis for both legal and political actions undertaken jointly by the governments of Australia and the Netherlands. A few years later, the Kremlin refuted accusations that it was behind the poisoning of the former Russian double agent Sergei Skripal and his daughter in England. Instead, Moscow keeps sharing various conspiracy theories with the aim of blaming such countries as the Czech Republic, Germany and Great Britain. However, such subsequent claims and denials are becoming less and less effective. Official statements issued by the Russian state do not seem to be credible then. They have already denied both the evidence and common sense, which made them closer to Soviet propaganda. If Russian does not accept any concession, even on Ukrainian issue, Putin cannot count on any real breakthrough in relations with the Europe, and more specifically, its Western part. There are some problems that cannot be solved immediately. In the case of Crimea, Russia is not ready for any concessions. To the contrary; for Vladimir Putin, it is a trap. It makes it impossible for Russia to get along with the EU as his hitherto actions constitute serious violations of international law while accepting the annexation of Crimea would make way for other activities of that kind. Putin does not want to negotiate with Europe in such strategic matters as Syria, Iran or Ukraine. In spite of the presence of such leaders as Emmanuel Macron or Shinzo Abe at the economic forum in St. Petersburg, the Russian leader did not make any specific proposals. It seems that Putin expects absolution without even expressing regret for his country’s sins (not to mention penance for what Russia has already done). However, there are some more obstacles as evidenced by the question of Iran. As for the nuclear deal, Moscow sides with other important European capitals, including Berlin or Paris. But at the same time, Putin and Macron have different ideas about the Iranian presence in Syria. Other problems are not so much of political nature; instead, they have rather economic character. Foreign investors are deterred by numerous scandals that have recently sparked in Russia such as corruption schemes in Russia’s major oil companies Gazprom and Rosneft and firing two Sberbank analysts who had written a report criticising the institution’s abusive practices. Putin’s warming policy is blatantly hindered by the campaign, carried out primarily due to joint American-British initiative, targeted at corrupt business schemes (interestingly, they are highly profitable for the Russians). 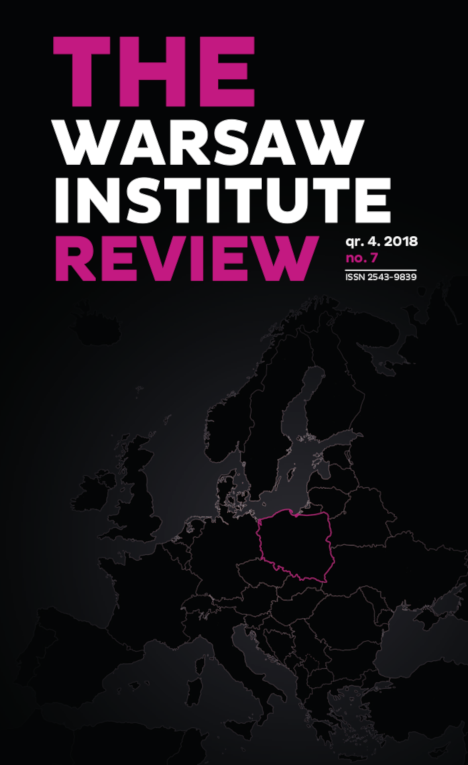 Russia’s influence on the West is impeded by such factors as sanctions as well as disclosing instances of money laundering in Estonian and Latvian banks and British activities in the City. On May 31, President of the European Council Jean-Claude Juncker has called for an end to “Russia-bashing”. The situation took place only two months after scores of Moscow’s diplomats across the EU were expelled in response to the use of a nerve agent in the UK. “I do think we have to reconnect with Russia,” Juncker told an audience in Brussels. “I am not very happy with the state of our relations. We will never accept what Russia did with Crimea or eastern Ukraine. But nevertheless, we have to have in mind that the entire territory of the European Union is about 5.5m sq km. Russia [is] 70.5m sq km”, said the European Commission President. Such words, aiming to establish cooperation in various domains, seem to perfectly fit the Russian strategy, according to which contentious issues should be ignored whereas any other ones need to be highlighted. In the light of such an approach, Russia’s foreign partners are expected to strive for enhancing gas cooperation and, at the same time, they should avoid mentioning the case of Crimea’s annexation. Thanks to this attitude, Western countries could save face even if they do some business with Moscow. And yet, Juncker’s words coincided with the declaration of Dutch Prime Minister Mark Rutte who was determined to hold the Kremlin to account for the downing of Malaysia Airlines flight MH17 over eastern Ukraine in 2014. Apparently, the American lobby in Brussels will not lead European states to adopt stricter restrictions against Russia. While in 2014 the U.S. and EU sanctions seemed coordinated and affected Moscow to the same extent, Western countries became less and less consistent in introducing further sanctions. Americans keep tightening the screws on Russia whereas Europeans need to enjoy the idea of extending the existing restriction for another six years. 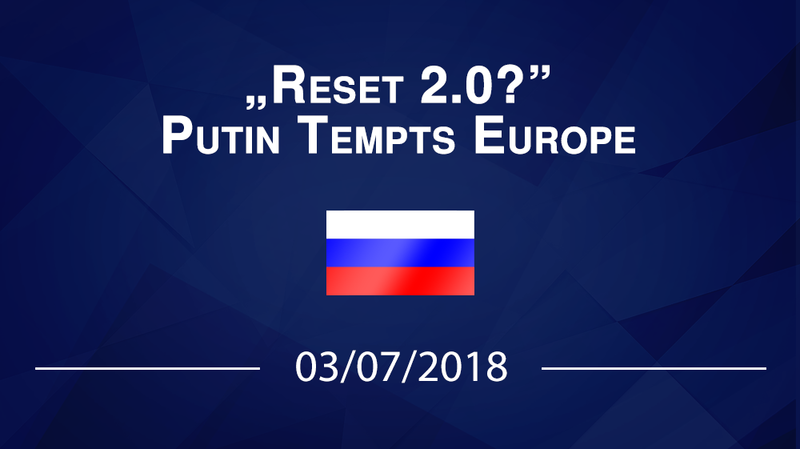 Russia’s actual alliance with Germany and some smaller countries (like Austria) is not enough for Vladimir Putin to introduce his reset strategy in relations with Europe. While Britain, Poland, Baltic countries, the majority go Scandinavia and a few other EU countries (as well as Ukraine) have formed a coalition with the United States, Russia will aim to sway France in its favour. French President’s meeting with Vladimir Putin, held on May 24 on the occasion of the Economic Forum in St. Petersburg, could be hardly regarded as particularly warm, especially when compared to the visit of Angela Merkel (Sochi, May 18). In St. Petersburg, Macron underlined the importance of relations with the United States and his country’s commitment to maintaining the alliance, even in spite of their divergent opinions on trade and the Iranian question. Without any progress in the case of Ukraine, there will be no changes in the sanctioning regime. A little earlier, both French and German leaders have paid visits to the United States. During his three-day visit, Macron was enthusiastically welcomed by Donald Trump while Merkel, who arrived on a one-day working visit, was received in a much less friendly atmosphere. Along with France’s involvement in Syria (supported by Great Britain and the United States; in April, the coalition conducted an airstrike on Assad’s facilities), it will be extremely difficult for Vladimir Putin to convince Emmanuel Macron to joint a Russian-German camp. As a result, it should be expected that the Kremlin would sooner or later abandon its current course. Russia’s lack of success (such as for example even the partial lifting of sanctions and Trump’s concessions in international security issues that would be important for Russia, including Syria and Ukraine) will probably result with the increased pressure exerted by the “party of war” on the Russian leader. Russia’s “hawks” have an ally in an unstable bureaucratic machine. Implementing even part of the objectives set out in the decree of 7 May would require at least a reduction of corruption, liberalization of the law, opening up of the economy and many other conditions. Nonetheless, such a state of matters would require breaking the siloviki’s resistance. It seems that the Kremlin’s brand-new policy will last until Putin realizes that the West, and especially the United States, has not been fooled by Russians “reforms” and does no longer believe in Putin’s readiness to reach a compromise on the most serious issues (in this case, Russia strongly disapproves of the resistance of some of the country’s elites and a large part of society). So another turn towards Russia’s aggressive foreign policy will take place and the old government will be replaced by the new one, throwing Kudrin’s ideas into a dustbin.